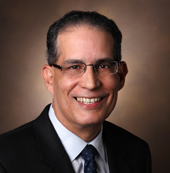 The Gerontological Society of America (GSA) — the nation’s largest interdisciplinary organization devoted to the field of aging — recently presented Walter Frontera, M.D., Ph.D., chair of the Department of Physical Medicine and Rehabilitation, with its 2015 Excellence in Rehabilitation of Aging Persons Award. According to the GSA, the honor is given each year to acknowledge outstanding contributions in the field of rehabilitation. The awardee’s work may be in the areas of teaching or patient care or publications that may include scholarly works, books, monographs, administrative directives or public policy papers. Frontera is the inaugural chair of the Department of Physical Medicine and Rehabilitation, where he also serves as a professor and medical director of rehabilitation services. His research interest is the study of the basic mechanisms that underlie skeletal muscle dysfunction in older adults and in patients with chronic disease. Part of his research concerns the use of exercise to slow down and rehabilitate muscle weakness and atrophy in various populations, with a special emphasis on older adults.